Those concerned with the security and welfare of the Jewish state keep asking questions like "Is Israel Doomed?" and Will Israel Survive? (also in French, Israël peut-il survivre?). One author even titled a book The Late Great State of Israel. This gloom results from the unique barrage of threats facing the Jewish state. These include weapons of mass destruction, conventional armies, and terrorism; economic boycott, demographic challenge, and political delegitimization. No country at present – and perhaps in all history – faces such an array of dangers, from mass violence (Iranian nuclear bombs) to intellectual sabotage (professors of English). As an aside, threatening the very existence of a country is a distinctive feature of modern Middle East politics rarely found elsewhere in the world: other examples include Kuwait (which actually disappeared into the Iraqi maw for half a year in 1990-91), Bahrain (under intermittent threat from Iranian imperialists), Jordan (seen as an illegitimate British imperial creation), Lebanon (eyed covetously by Syrians), and Cyprus (invaded by Turkish forces in 1974 and newly under threat again). 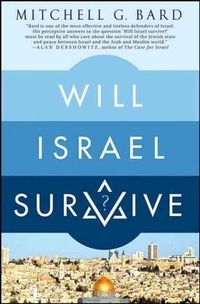 One of several books questioning Israel's long-term viability. First, Israel is strong. The country is characterized by military prowess, high technology capabilities, a strong economy, a booming energy sector, robust population growth, and cultural creativity. Over time, it grows increasingly more powerful than its enemies. Second, Israelis show a historically unprecedented willingness to compromise. The Israelis' having returned a captured Sinai Peninsula three times to Egypt (in 1949, 1957, and 1982) has no parallel in the history of war and diplomacy. Nearly all the territories Israeli troops conquered in 1967, with the exception of historic Jerusalem, has been open for discussion since just a week after their seizure. In the history of warfare and negotiations, no victor has shown such a willingness as Israel to make "painful concessions" to reach a deal; which other leader has proclaimed, as Ehud Olmert did before and during his prime ministry, that "We are tired of fighting, we are tired of being courageous, we are tired of winning, we are tired of defeating our enemies" and "Peace is achieved through concessions"? Third, no state of hostilities goes on forever. Circumstances change, new enemies appear, old angers dissipate, willpower grinds down. Even the longest lasting conflicts eventually get solved. The English and French states, for example, fought each other for over seven centuries before they finally reached an "Entente cordiale" in 1904, allying in the face of an emerging German foe and since then remaining steadfast (if irascible) allies. The Arab-Israeli conflict, one century old, also will not continue unendingly. One has to wonder for how long the Palestinians and their supporters can sustain their goal of eliminating Israel. As the generation of 1948 refugees dies off, will its children, grandchildren, great-grandchildren, and further progeny continue to dream of a future in Jaffa or Haifa, rather than where they actually live? How long can they mortgage their lives to an ever-more remote irredentism? Nayef Hawatmeh (b. 1937), an aging terrorist, acknowledges profound mistakes. Fourth, Palestinians will realize that blind devotion to extremist and rigid ideologies leads to a dead-end. This process has already begun. For example, interviews with extremist Palestinian leaders of an earlier era – Nayef Hawatmeh, Ahmed Jibril, Leila Khaled, and Mohammed Oudeh – shows how the passage of time has changed their perspectives and led to the acknowledgment of basic mistakes. Hawatmeh, leader of the Democratic Front for the Liberation of Palestine, notes that "After 60 years, we are struggling for what we could have had in 1947. We have missed many historic opportunities." Oudeh, planner of the Olympic games attack in 1972 that killed 11 Israeli athletes, says that "maybe, just maybe, we should have shown some flexibility. Back in our days, it was 'the whole of Palestine or nothing.' But we should have accepted a Palestinian state next to Israel." Hawatmeh and the others forwarded a nationalist agenda which time has passed by and that now has little appeal. The same, no doubt, will happen to today's favored ideology; however strong they are today, the Islamist forces of Hamas, Palestinian Islamic Jihad, and Hizbullah shall also lose their vitality one day, and their old men will express a similar remorse about opportunities missed. So, yes, the conflict will come to an end. 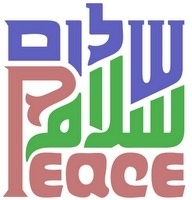 "Peace" is a subtle concept, not suitable for sloganeering. What kind of peace? As Martin Sherman notes, the word "peace" contains within it two distinct meanings – one concerning relations between two democratic polities, the other between one or more non-democratic polities. The first refers to what Sherman calls "a condition of mutual harmony between states, maintained by the inherent preference of all parties to preserve a nonviolent status quo. … Not only are differences settled in a nonviolent fashion, but the use of force is virtually inconceivable." The United States and Canada exemplify this relationship. The second meaning refers to "an absence of war maintained by deterrence. In this case, only the threat of exorbitant costs dissuades one or both sides from violence. … there is no harmonious interaction between peoples of the various states. Movement across frontiers tends to be highly restricted, heavily regulated, and often totally forbidden." The United States and the Soviet Union exemplified this relationship. Israel is a full democracy but not so any of its neighbors, nor are those neighbors on their way to becoming democratic, despite the upheavals of the past year. Therefore, peace between the two sides is likely long to remain of a deterrent nature, being the armed peace of deterrence with limited human contact. Less than ideal, it will have to do until deep changes take place in the Arabic-speaking countries and a democratic peace can finally go into effect. How? Before an Egyptian-Israeli peace treaty was actually signed in 1979, it was assumed that this would lead to a general ending of the conflict because Egypt is the strongest enemy of Israel. That assessment turned out to be wrong because the signature of a military autocrat (Anwar el-Sadat) persuaded few others. For several years in the 1980s, I focused on the Syrian government, arguing that "The conflict will go on until Syria follows Israel's other three neighbors and resigns itself to Israel's existence; once this happens, the struggle will come to a rapid end." That also turned out to be wrong, for Damascus commands little loyalty among Islamists, professors of English, or members of the United Nations. Instead, the Palestinians of the West Bank and Gaza are key. When they tire of conflict, it will end. When? The conflict will go on for about another generation and may be resolved in about the 2030s. This estimate is based on the assessment that the conflict was ripe for peace twenty years ago, in the aftermath of the Kuwait war and the Soviet collapse but was derailed by a combination of Israeli naïveté and Palestinian deceit. Only now, after a long and painful detour, have Israelis begun to figure out the mistakes of diplomacy they made in the Oslo Accords and succeeding efforts. Starting about now, it could take about twenty years for the correct path to lead to a breakthrough. Who will win? The Oslo process of 1993-2000 showed that compromise is not, in fact, a solution. As in most conflicts, the end of hostilities requires someone to lose and someone to win. The war terminates either when Arabs accept the sovereign Jewish state or when Israelis give up the Zionist project. It ultimately comes down to a raw question of which side will first crush the other's will. The alternatives are stark and dual; efforts at mitigation actually only postpone a resolution. 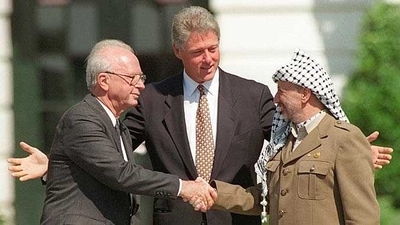 The Oslo handshake to nowhere, Sep. 13, 1993: (L-R) Yitzhak Rabin, Bill Clinton, Yasir Arafat. I hope Israel will win, for a Palestinian victory brings the doubly undesirable result of the destruction of a modern liberal country and its likely replacement by a Hamas-dominated Islamist state. An Israeli victory, in contrast, destroys extremism and actually liberates the Palestinians from their present plight. Only when Palestinians give up on their anti-Zionist dream of destruction will they be able to invest their efforts to creating an attractive polity, economy, society, and culture. Only when Palestinians give up destroying can they build. Each of us must do his part to make sure the conflict ends with a positive outcome. Jan. 21 2014 update: The Dorchester Review reposted this article today, on the occasion of Canadian prime minister Stephen Harper's remarkable visit to Israel. Related Topics: Arab-Israel conflict & diplomacy, History, Israel & Zionism | Daniel Pipes receive the latest by email: subscribe to the free mef mailing list This text may be reposted or forwarded so long as it is presented as an integral whole with complete and accurate information provided about its author, date, place of publication, and original URL.